Located 25 minutes from the nearest town of Page, Arizona — is a remote and luxurious hideaway tucked within the canyons of the great American Southwest. 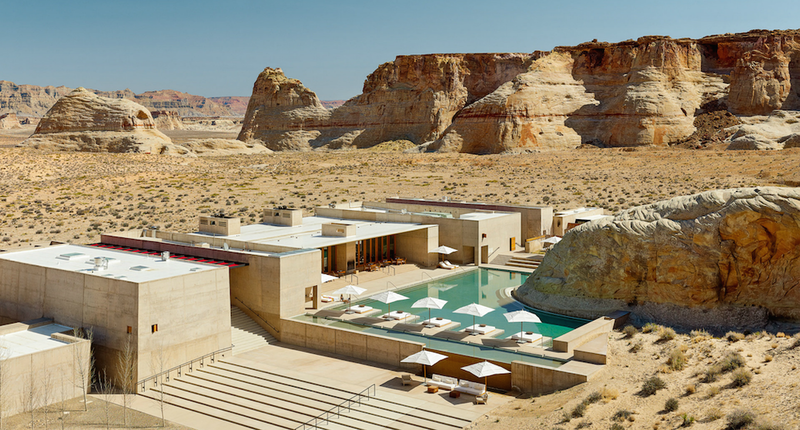 Amangiri is situated on 600 acres in Canyon Point, Southern Utah, tucked away in a protected valley with sweeping views toward Grand Staircase-Escalante. This area is known as the Grand Circle region; where five national parks, numerous national monuments and the Navajo Nation Reservation (largest Native American reservation in the United States) are all located. However, don't let this resorts remoteness fool you. Amangiri boasts 34 luxurious suites — all offering private terraces, fireplaces, king-sized beds and private courtyard entrances. All suites are meant to reflect the dazzling glow of the surrounding desert landscape with the incorporation of white sand stone floors, concrete walls, natural timbers, and blackened steel fittings. If fine dining is what you are into, then you'll enjoy Amangiri's carefully crafted and American Southwest inspired cuisine. The menu is driven by local and seasonal ingredients with a modern approach. Made in an open kitchen and cooked over a wood-fired oven. The dining room is open for breakfast, lunch and dinner; overlooking the main swimming pool — with the option for both indoor and outdoor seating. Last but not least at Amangiri is the Aman Spa, a destination in its own right — providing a serene setting for relaxation and rejuvenation. The holistic spa menu draws on Navajo healing traditions, with spa journeys designed to restore hozho. Navajo for ‘beauty, harmony, balance and health’. This type of luxury does come with a cost; however, it is an experience you won't forget.